This countertop pizza oven will get sales heated up. The aroma of fresh baked pizza from this pizza oven will have hungry customers lining up at your counters. Entice them even further by using the oven as a hot sandwich oven. The more variety you can offer to your shoppers, the more likely they are to return. 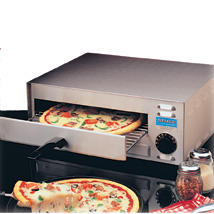 This electric pizza oven is easy to clean, takes up little counter space and comes with a 14” rack. With a built in 15 minute timer and a preset thermostat for 450 F. makes using this commercial oven easy. Offer simple, fast and fresh baked goods when you purchase this oven for pizzas today. For fast convenient heating of pizza, sandwiches and other foods, these high quality, versatile ovens are the answer.